There are a few things that I really look forward to on this journey of mine. Well, actually, there are a LOT of things, but one of the big milestones is getting ready to happen! It could happen tomorrow or two days from now, but it’s coming. In my past life, I never would have spoken about my insecurities or my weight to anyone let alone the WWW, but here goes…I am on the cusp of breaking the 200 mark (yeah, I said it…200 lbs and, just so you know, it will be the last time I say it!). Yippee skippee! (yeah, I said that, too) I have not weighed less than 200 lbs since about 7 years ago. My husband and I celebrated our 7th wedding anniversary last December. I got pregnant pretty quick after we married and well, if you are female and married, or have children, you know the rest. If you have read my first post, Whole 30 and a Life 180, then you know I have been waiting my entire life to be on the road I now find myself walking. I knew the day would come for me and it did! Just not the way I imagined it would. I don’t weigh in/measure very often anymore. I don’t need to…I have scrub pants that I have to roll up so that they don’t fall off of me so I know, without weighing, that I am losing weight. In the past, I would have been on the scale every day. The thing about the Paleo lifestyle is you don’t have to count calories. That’s kind of how it is when you are eating real food… it’s all good for you, so it doesn’t really matter. Now, don’t get me wrong…you can’t eat a ton of fruit or “treats” and expect to lose, but if you moderate your sugar and watch how much you eat of the higher carb veggies, you will be fine. So, I have let go of the numbers. The scale haunts me no longer. It has quit calling my name. I think it might even be collecting a little dust. Poor scale. So lonely. Today, though, I weighed in. I took my measurements and wrote it all down. In fact, I panicked because it had been so long since I last measured that I forgot where I put the notepad that I wrote them down on. I was so upset with myself thinking I didn’t keep it the last time I measured, but then I found it. Right where I put it. Story of my life. Today the scale read 200 lbs. right on the money. That’s 24 lbs. less than I weighed just two short months ago. I have lost 3.5 inches off my waist and 3.5 inches off my hips. My thighs are down 2 inches and my leg (from the knee down) is down 1.5 inches. My wrist is half an inch smaller, which means I can almost wear my nice watch again! I have a goal, and I am now 1/3 of the way there. How cool is that?? Seriously cool, if you ask me. I don’t think I have ever been happier! or more energetic! Have you ever had that feeling that everything you have done in your life has been leading up to this one certain thing/moment/place? That is the BEST part of all of this…knowing that I am in this for life now. It amazes me every day to know without a shadow of a doubt that I WILL reach my goal. Having that feeling is something I have only ever dreamed of. Oh yeah, I had din din at the computer tonight. Inspiration (once again!) 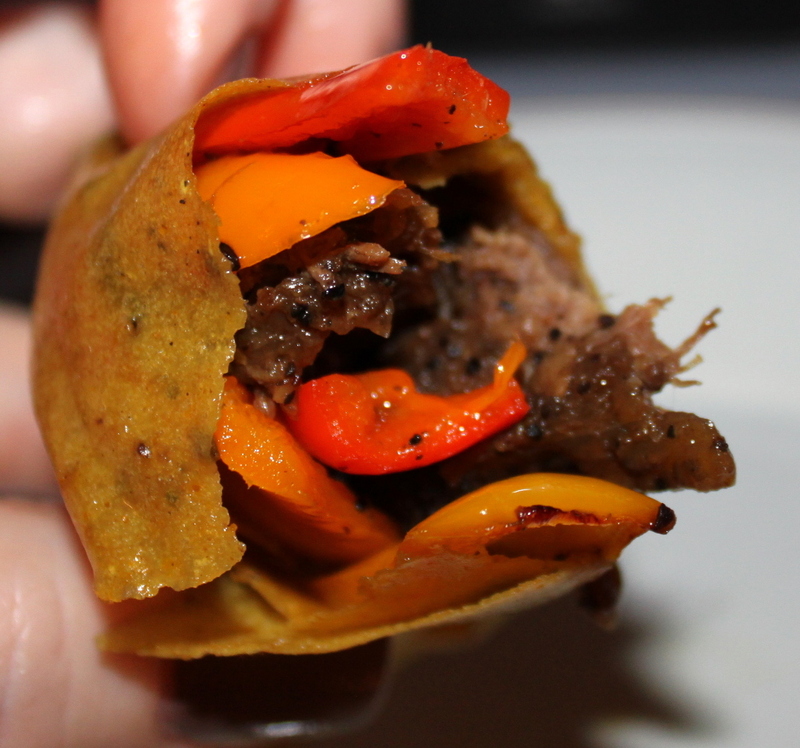 from nom nom Paleo‘s lunch today made with leftover grass fed pot roast meat from Everyday Paleo, sauteed peppers and a curry Pure Wrap. Thanks, ladies! I apologize for the “bite” pic, but I had almost scarfed the whole thing before I remembered to take a pic. It was delish! This entry was posted in Uncategorized and tagged Paleo, weight loss, whole 30.